Product information "Crown CRYO tang tool 19 mm radius skew." 19 mm radius skew. These tang tools are specially fixed into a 16 mm round bar. A special metal liquid is used to set them firmly in place. They can then be used in the red quick release head or 16.5 mm grub screw handle. It has long been understood that by subjecting metal tools to elevated temperatures and then rapidly cooling them, the properties of the metal can be altered. This happens because the crystal structure of the metal is altered to change the way the metal reacts when in use. The two main crystals in tooling steel are the larger and softer austenite and the smaller, more stable martensite. Through heat treatment, we look to transform the austenite to marten site to produce steel with good wear characteristics and an amount of ductile properties. When combined with a good quality heat treatment, the cryogenic process greatly enhances the austenic transformation. Also at these extreme temperature of -301F (-185C), fine ‘eta’ carbides are formed within the carbon structure. Growing very slowly and only at these very low temperatures, ‘eta; carbides are extremely small and act as a ‘filler’ between the other crystals in the metal. 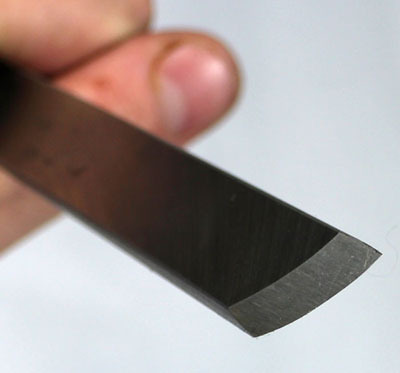 The combined effect of the cryogenic processing is to produce a refined crystal structure in your hand tool that will give a lifetimes service by producing a blade that will retain its edge longer and give a superior ‘feel’ in use. Related links to "Crown CRYO tang tool 19 mm radius skew." Customer evaluation for "Crown CRYO tang tool 19 mm radius skew."